For the ESP8266 see here. Deep sleep. Easy and flawless. That includes waking up by timer, by GPIO, touch controller and co., ultra-low-power coprocessor programs and wakeup stubs. 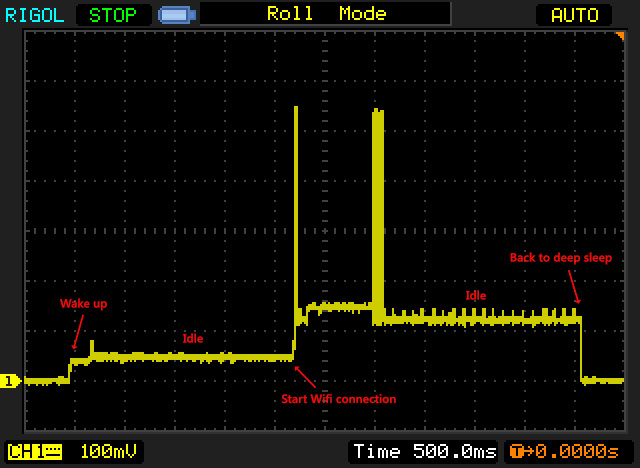 Note that compared to the ESP8266 the Wifi hardware stays switched off until needed (good! ), but pulse current and idle power is higher. This is probably because the CPU frequency is higher. The CPU frequency can be selected but it’s complicated (there’s no runtime API call, the firmware needs to be rebuilt) and completely unsupported in the Arduino core.